This is for the artistic scientist, or the scientific artist. On September 15 entries close for the Vizzies, formerly SciViz, the contest that recognizes the year’s best science images, apps, and videos. Sponsored by National Science Foundation and Popular Science, the Vizzies have been showing us a new perspective on real science since 2003. The categories are photography, illustration, video, interactive, and posters, and graphics. There are both expert and people’s choice winners in each category. 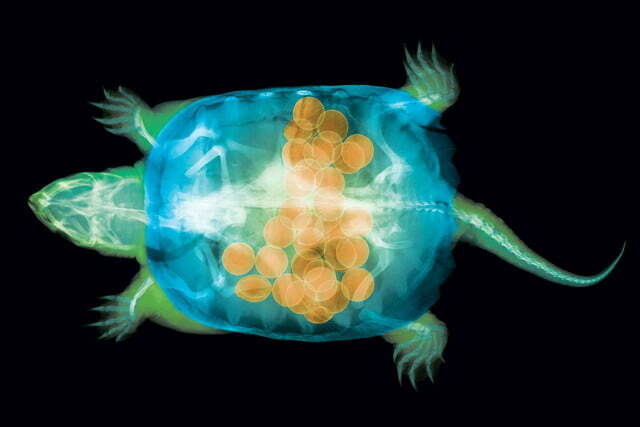 For example, last year’s experts chose “False-Color X-ray of a Snapping Turtle” by professor of photographic sciences Ted Kinsman as the photography winner. Inside you can see 30 eggs accentuated by false color addition. The common vote chose the alcian and alizarin chameleon image as the winner for best photo. 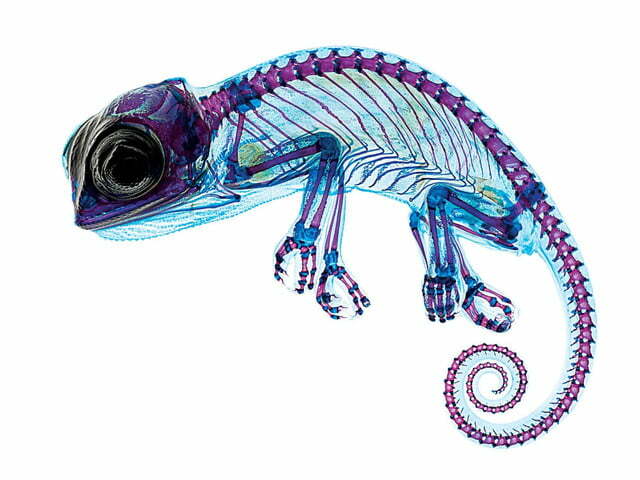 It’s an actual chameleon specimen that has been dipped in chemicals to make its skin and muscles transparent. Its bones and joints were at the same time stained with dyes. Photographer Elizabeth Marchiondo incorporated 32 images into the final picture. The experts and the common vote agreed on the winning illustration. 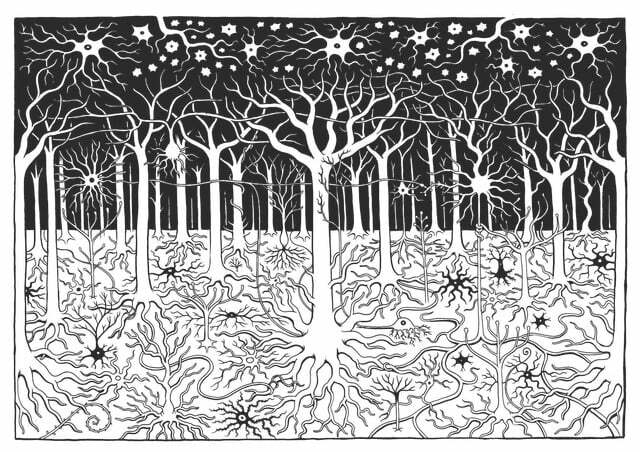 Titled “Neuroforest,” it’s an illustration from Neurocomic, a graphic novel by neuroscientist and artist Matteo Farinella about a man who falls into a brain. The brain cells and neurons are shown as a dense sprawling network of trees, or a forest, where tree roots and branches intertwine. For the posters and graphics category, experts chose what is kind of a visual inside joke: “Hippocampal Neurons” by neuroscientist Robert E. Clark. The brain’s hippocampus (responsible for a good deal of memory functions) looks like a seahorse. 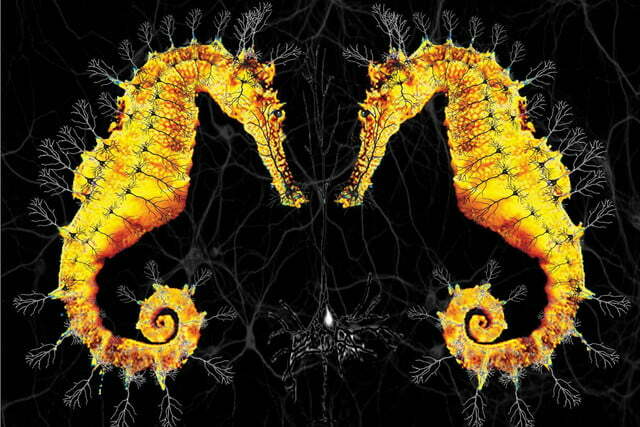 Oh, and there’s the fact that Hippocampus means “horse sea-monster” in Greek. 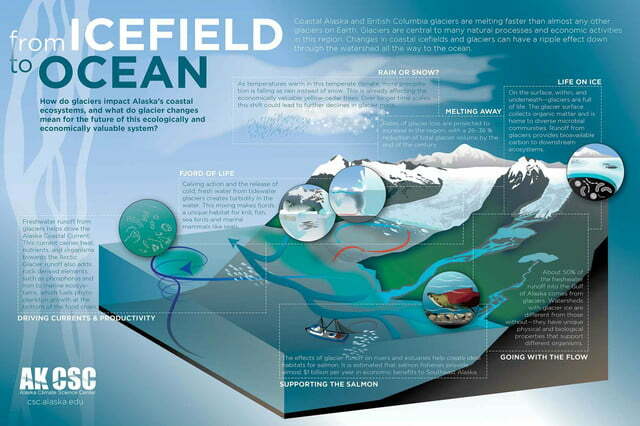 The people chose a graphic by Kristin Timm, Shad O’Nell, Allison Bidlack and Eran Hood of coastal glacier changes, born of a collaboration at the Alaska Climate Science Center. The Glass Brain won the expert’s choice for the best game or app, beating out NASA’s Visualization Explorer. The Glass Brain is a Unity3D visualization of the human brain that shows electroencephalographic activity and connectivity in real time using SIFT (Source Information Flow Toolbox) and BCILAB, a MATLAB toolbox for EEGLAB. It was first used in 2012 in front of a concert full of people on Grateful Dead drummer Mickey Hart to show his brain reacting to music. The app is still developing, and is not yet being used for clinical applications, but it’s an awesome party trick. Thanks to Adam Gazzaley, Roger Anguera Singla, Rajat Jain, Tim Mullen, Christian Kothe, John Fesenko, Oleg Konings, and Matt Omernick for this cool tech. NASA’s Visualization Explorer shares the data that scientific agencies used to keep to themselves for study. Along with programmers at the Goddard Space Flight Center, NASA released this app available via iTunes that publishes visualizations from NASA centers and more twice weekly. Larry Howell, Julie Walker, Robert Lang, Spencer Magleby, and Brian Wilcox presented this video of “How origami is inspiring scientific creativity.” Origami principles are used to design the flexing and furling parts of spacecraft solar panels. The vid took last year’s People’s Choice award for best overall. You have to be 18 years old and either a US citizen, national, or resident to enter. Check here for complete rules and a PDF entrant’s package. Experts’ choice winners receive $2,500, while People’s Choice winners get $500.